Battlepillars is a Free-to-Win real-time strategy game now available on iOS and Android! In Battlepillars you command caterpillars armed to the teeth with flamethrowers, sticky honey, mines, machine guns, and more! Players can conquer their way through a 50 level campaign with 5 big boss Battlepillars or take the fight online with real-time multiplayer! Don’t forget to check out the Test Zone for testing new strategies, and Endless Mode where players must survive for as long as possible against the combined onslaught of the red caterpillar army! 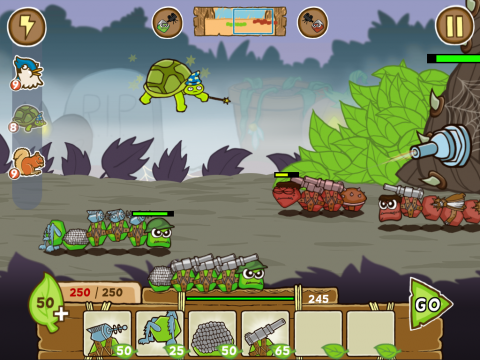 Battlepillars takes full advantage of MonoGame and Xamarin technologies to go cross platform. We also take advantage of several native SDKs on each platform. We have integrated Game Center multiplayer on iOS, Google Play Game services multiplayer on Android, and the Samsung Chord SDK. We also included support for in-app purchases on these app stores as well as push notifications.